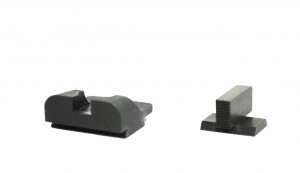 There are benefits of longevity and rigidity by selecting a fixed rear sight over adjustable rear sights. However, you sacrifice absolute zero especially if using a wide range of bullet weights. The information below should help bring your groups closest to Point of aim(POA)/Point of impact(POI). For most FNS pistols and ammunition we recommend .220” tall fronts. Point of impact (POI) with most 115 grain and 124 grain ammunition should be at or slightly above point of aim (POA) at 25 yards. We have found heavier weight bullets, 135 grain and 147 grain, will hit slightly higher than 115 grain and 124 grain with the .220” tall fronts at 25 yards. Some pistol and ammunition combinations may require a lower front height. The .200” tall fronts in plain and fiber optic are NOW AVAILABLE! We recommend a .240” tall front only if experiencing greater than a 3” point of impact with a .220” tall front at 25 yards. There has been mixed POA/POI feedback for the respective front height selections. Our recommendation is the .220” because it is better for the bullet impact to hit slightly high at a given distance than to hit low. Additionally, the shorter front will offer correction for those experiencing an unusually low POI with their pistol. Our goal is to help FN customers get the best results with their respective pistol and ammunition. All sight ratios allow for fast acquisition and precise alignment when engaging at speed. Taylor your selection based on personal preference and type of shooting. .150” wide rear notch with a .115” front- Best for practical shooting, speed steel and target shooting. Fairly open sight picture. .125” wide rear notch with a .105” wide front- Best for practical shooting, speed steel and target shooting. Slightly tighter sight picture than the .150” rear/.115” front. .125” wide rear notch with a .115” wide front- Best for PAR-time shooting sports and target shooting. Tightest sight picture. Aiming surface of the FNS front sight is back drafted with 50 LPI serrations. Aiming surface of the rear sight is back drafted and smooth; free of distracting undercuts or serrations. The contrast between the flat rear and serrated front provides the cleanest sight picture available. 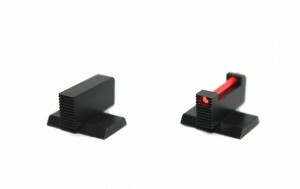 The rear sight set screw is intended for secondary retention. If fit properly the sights will not move. 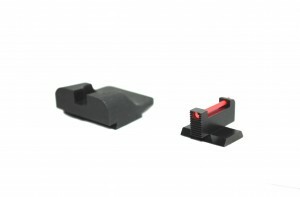 All sights are matte black with rust preventative finish.